Category Archives: Cars, cars, cars, cars cars! Now, I’m not yet admitting that its become an obsession, but owning four ‘classic’ cars, three of which happen to be Triumphs, should, I have to agree, probably be thought of as something more than an ‘ enthusiasm’. Of course, on the positive side, with interest rates routinely running some way below inflation, buying cars that we can enjoy and which will hopefully increase in value could be thought of a sensible investment. On a rather more negative note, finding somewhere to keep these investments warm and dry is starting to prove a bit of a problem. No matter ….. as Wilkins Micawber so prophetically said, ……..’something will turn up’! In point of fact this latest extravagance is really an early BIG birthday present for ‘er indoors’; and as Denise has promised that she’s going to be responsible for everything short of major repairs and maintenance, I probably won’t even get around to opening the bonnet from time to time. Fat chance! Just look at the little beauty! 1960 Triumph TR3A, originally exported to the USA before being re-imported and completely rebuilt in the early nineties. Around 75,000 probably genuine miles on the clock. Standard other than the change to an overdrive gearbox (apparently from a TR4), the engine capacity increased to 2.2 litres (as per the TR4), and the addition of a rollbar, full harness seatbelts and Minilite type wheels. The missing bumpers will be replaced with stainless steel versions as part of the purchase. How Much Can You Trust an MOT Inspection ? There’s currently a bit of a debate about the future of the annual MOT inspection for older cars. Apparently the UK testing regime exceeds EU requirements and as a result there’s a suggestion that cars older than 30 years (vehicles registered prior to 1960 are already exempt) should no longer be subject to the test. Until very recently I was dead against the change and held firmly to the concept that the annual test is a ‘good thing’ in that it guarantees that our classic cars are safe and fit for the road on at least one day a year. Yesterday’s experience has caused me to wonder whether all testers are as diligent or competent as they might be, and therefore whether the test is as useful an indication of good maintenance as it should be. The story goes like this ………. Having spent the last six months rebuilding the GT6 I finally arrived at a point this week where I thought it should be tested. Not that I fully expected it to pass – but it seemed to me to be a good way of getting a fully qualified second opinion on whether it was fit for the road. In point of fact there were a couple of points on which I expected it to fail: despite several attempts at bleeding the brakes the travel on the pedal was longer that I liked, and I was convinced that the exhaust was blowing a bit. I sat nervously during the 90 minutes of the test, reassured that they were doing a thorough job, and sure enough ……….it failed. But not on the points that I’d expected! All that the tester could find to comment on was the security of the fuel line and the need for a brake hose to be moved slightly to avoid fouling a shock absorber. Great, I thought, and booked the car in for a re-test two days hence. On leaving the garage I’d travelled 150 yards when I noticed that the steering was behaving oddly; another 100 yards and I was convinced that something was seriously wrong and pulled over to the side to check out what might be amiss. Shock, horror – one of the track rod ends was extremely loose and the other had lost its securing nut and completely parted company with the steering arm on the near side vertical link. Had I been travelling at speed or attempted to take a corner in this condition an accident would have been inevitable. A phone call home brought Denise to the rescue with the socket set and some nuts and the problem was quickly solved, after which I was able to drive home thanking my lucky stars that disaster had been averted. The fact that the track rod ends weren’t secure was obviously my fault – but my point is that the test failed to find the most simple, and potentially dangerous, of faults and was therefore completely worthless. and left me wondering what else they’d missed. One of the arguments for abandoning the test for older vehicles is that most owners of classic cars are enthusiasts and quite possibly know more about how to keep their particular vehicle safe than the majority of MOT testers. So, recognising that we all have a legal responsibility for ensuring that any vehicle we use on the public highway is safe, we should, perhaps, abandon the requirement for an annual MOT check, learn to cope without that particular safety net, and save ourselves £39 in the process! February with its cold and wet weather and short days is probably my least favourite month of the year. More particularly, getting out into our unheated garage to work on the GT6 over the past month has proven to be a bit of motivational challenge – on some days even dressing up in my ‘onesie’ (actually a set of coveralls) hasn’t entirely managed to keep the cold at bay and the desire to stay out there fiddling with the car has definitely been limited. Emigrating to warmer climes or getting the use of a heated workshop in which to work would solve the problem, but as neither seems to be even a remote possibility I guess I’ll have to soldier on. Note to self – make sure the next (?) project is timed to take advantage of all those long, hot summer days (some hope!). 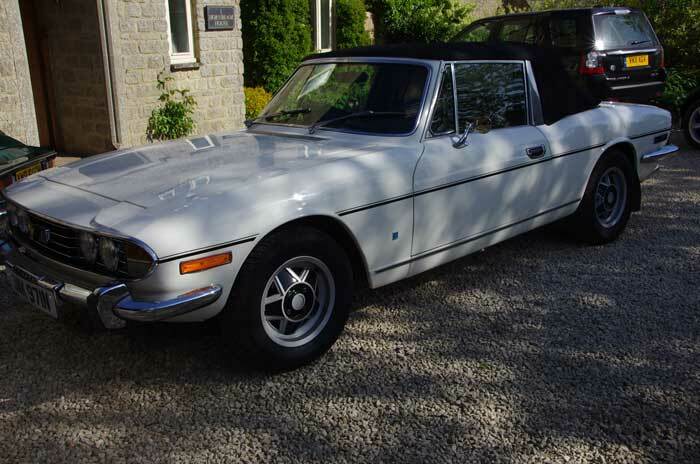 That said, I’ve made quite a bit of progress since my last Triumph blog and I still seem to be on target for getting the car back on the road in early April. The tub and bonnet came back from the body shop looking very shiny and, with the exception of one or two minor things that will need to be sorted by them once the car can be driven down to Gloucester, I’m very pleased with the quality of their work. Reuniting the tub with the chassis was less of a hassle than I’d feared and once that was done I was able to start the pleasurable task of starting to re-fit all the mechanical and electrical parts that I’d refurbished or replaced whilst the body was being re-sprayed. Monday of this week was a ‘red letter day’. After a couple of minor glitches, which included managing to replace the plug leads in completely the wrong order, I started the engine for the first time since the rebuild got underway last September. In fact it started remarkably easily and ran pretty smoothly considering that the timing was a bit adrift and the carbs will need to be adjusted. No nasty knocks or grinding sounds and as far as I can tell the oil pressure seems to be okay; on the subject of which I’ve decided to fit an oil pressure gauge to keep an eye on things in the future – I can’t understand why on earth they didn’t fit one as standard when the car was built. If the MGB could have one, why not the GT6? 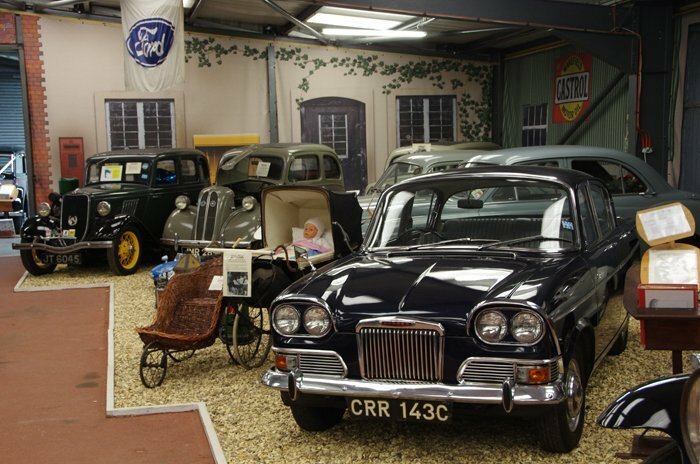 On Sunday I’m off to the Triumph Spares day at Stoneleigh to collect the new carpet I’ve ordered (at huge expense) and pick up a host of bits and pieces that I still need in order to finish the car. How much excitement can one man stand? 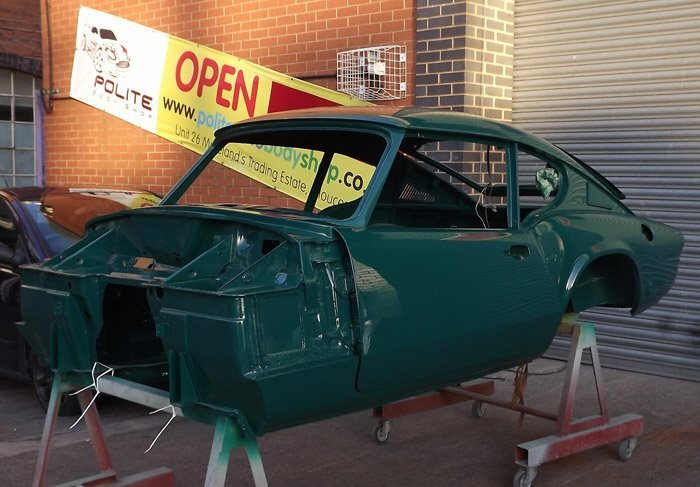 Well, the restoration of the GT6 body is almost finished and pretty soon it will be reunited with the chassis and I’ll be able to get on with the exciting business of working out how the whole thing fits together again. 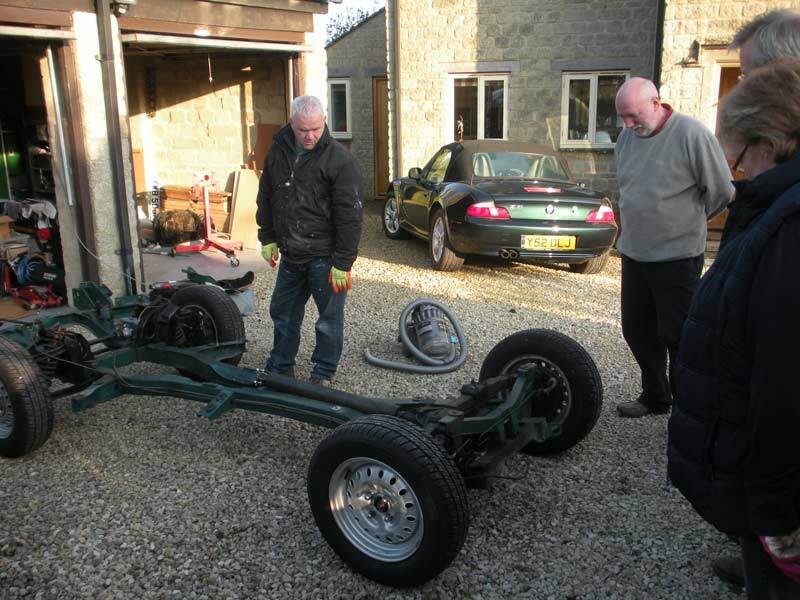 I reckon the reassembly will take me about three times longer than the dismantling – whether that puts me on course to have the car ready for the MOT in early April remains to be seen. There’s still plenty of cleaning, painting and polishing still to be done, to say nothing of an every-growing list of parts to be bought and fitted. The problem I have now is that having spent so much time and money on getting to this point I simply can’t afford not to do it properly. The good news is that every time I trawl the internet I find really grotty examples of the GT6 for sale at increasingly ridiculous prices – bring it on! 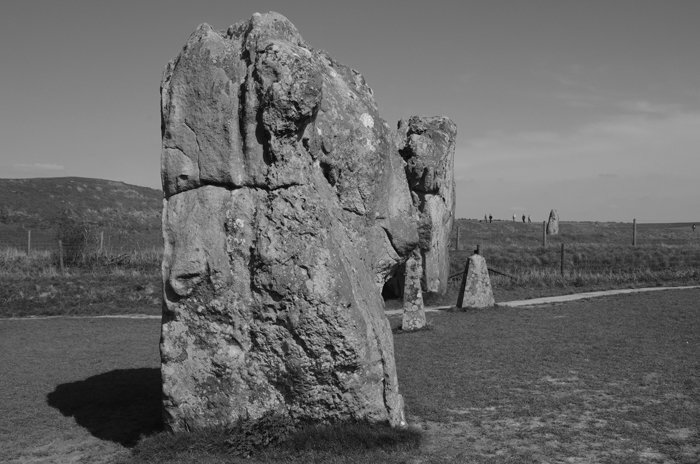 In the meantime Christmas has come and gone and we’re well past the shortest day and hopefully moving steadily back towards Spring. 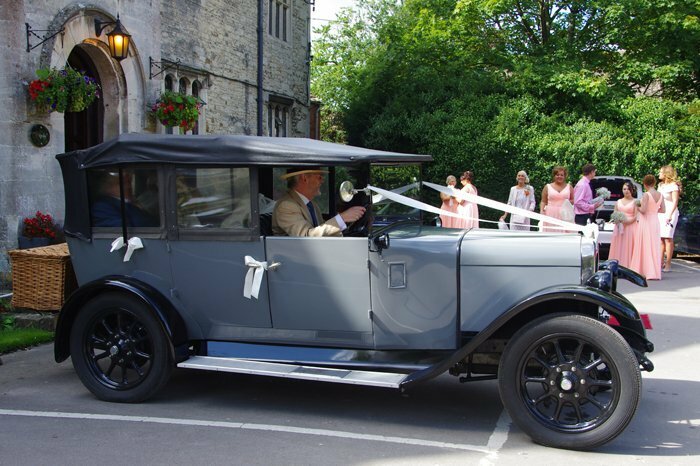 I’ve spent a few hours over the past week pulling together a website advertising Bertie’s qualities as a wedding car – something we always planned but I’ve been a bit slow in putting into action. Hopefully attendance at a couple of wedding fairs in the coming months will produce a handful of bookings and a few pennies to help pay for this expensive hobby! The problem with taking a car to bits is remembering exactly how it all fits together and ensuring that vital pieces aren’t missed out when it comes to the rebuild – not helped in my case by doing the whole thing in a domestic garage and therefore being pressed for space. That said, progress is being made and, having shipped off the body to the ‘Polite Bodyshop’ (yes, they are!) in Gloucester for a complete bare metal re-spray, I’ve spent the past month stripping, cleaning and re-painting the chassis and the remaining mechanicals. Re-assembly has unquestionably been made much easier by having access to a couple of Triumph/BMC parts catalogues which list every single component down to the last nut, bolt and washer, and illustrate in most cases how they all fit together. Although I’m re-using most of the serviceable parts, I’ve decided to replace most of the nuts, bolts and washers, which I feel lifts the whole restoration and will certainly make the next rebuild that much easier – if that ever comes to pass. With most of the running gear now re-fitted, and the engine and gearbox once again mounted on the chassis, I’m starting to convince myself that real progress is being made and we may even be on track to have the car back on the road in the early Spring. 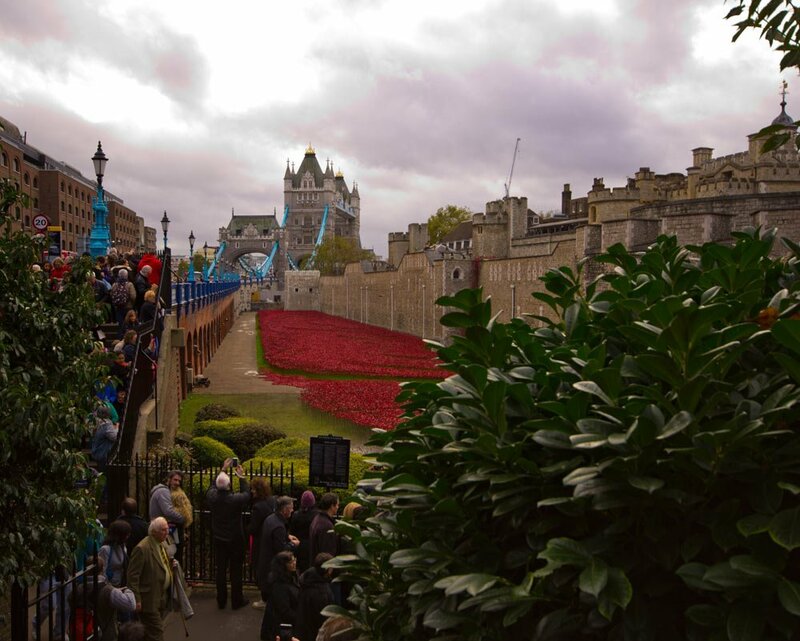 We realised last week that the display of 890,000 ceramic poppies currently filling the moat of the Tower of London will be removed after Armistice Day , so rather belatedly we decided to ‘pop’ up to town to take in the spectacle. Having met up with Jennie at Victoria we trooped off down to Monument tube and then walked the last few hundred meters to the Tower in a vain attempt to avoid the worst of the crowds. Some hope! The crowds were ten deep most of the way around the moat and moving around was a bit of a nightmare, but at least everyone was good natured and eventually we found a decent viewpoint. Definitely a worthwhile expedition. After a brief excursion to Hatton Garden and lunch with Jennie and Nathan we filled a couple of hours before our return journey with a trip to the Tate to take in the Turner Gallery – not entirely unconnected with having seen ‘Mr Turner’ (great film!) at the cinema the evening before. Fabulous seascapes and wonderful light but I have to admit to thinking that his figure painting was a bit rough! Meanwhile work on the Triumph continues apace. Yesterday afternoon we roped in friends and neighbours to help lift the body off the chassis in anticipation of taking it down to the bodyshop in Gloucester later this week. The chassis itself looks to be in really good condition and I can now get on with the task of sorting out the suspension and steering before I get the re-sprayed body back sometime before Christmas. 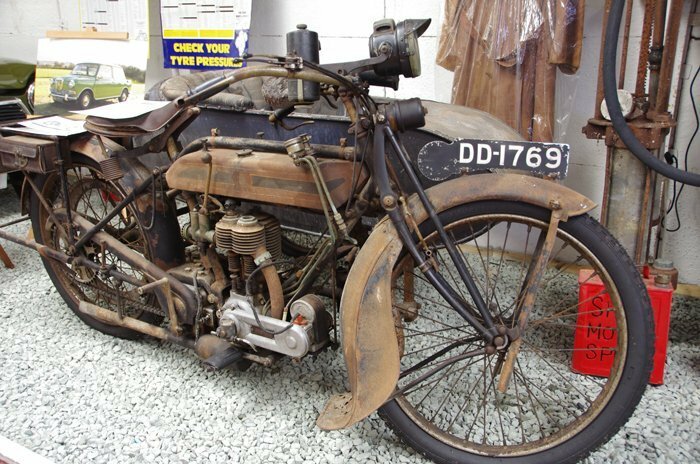 So – are all Triumphs powered by Dysons then? Oh dear! What have I started? 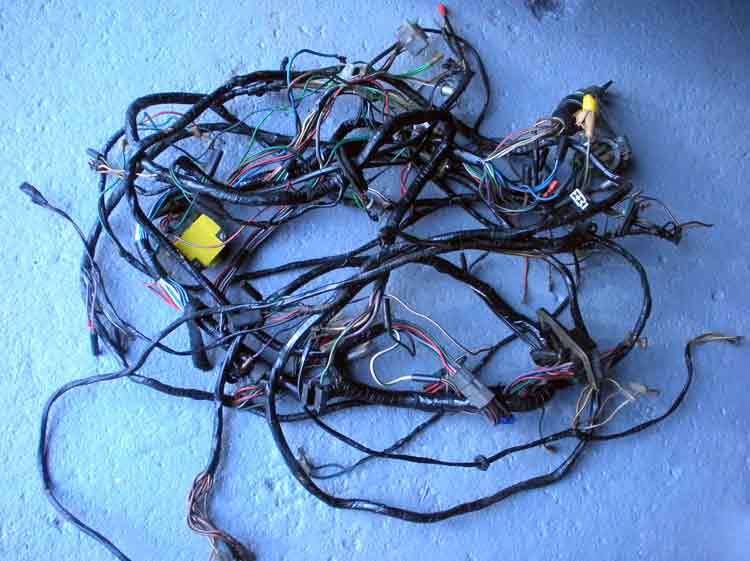 The strip-out of the GT6 is going well but I have to admit that seeing the complete wiring loom sitting there on the garage floor left me wondering whether I’ll ever be able to get the whole thing back together without the headlights dipping every time I switch on the windscreen wipers! What is absolutely certain is that when the time comes its going to take me rather longer to put it all back together than it’s taken to pull the poor car apart. 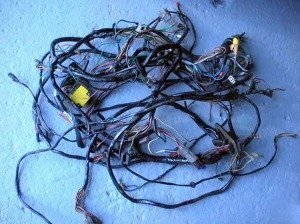 now, where exactly did that red wire go…………..? In the meantime I’ve sent the engine block, head and some other bits and pieces down to Malmesbury to be chemically cleaned and for the water passages to be ‘de-furred’ – the removal of forty odd years of calcification will hopefully help it to keep the engine running nice and cool in the future. The next step will be to get the bearings and bores checked/sorted before ordering the first tranche of new parts and starting the process of reassembling the engine. Over the weekend I spent a little time getting Bertie ready for his winter quarters. 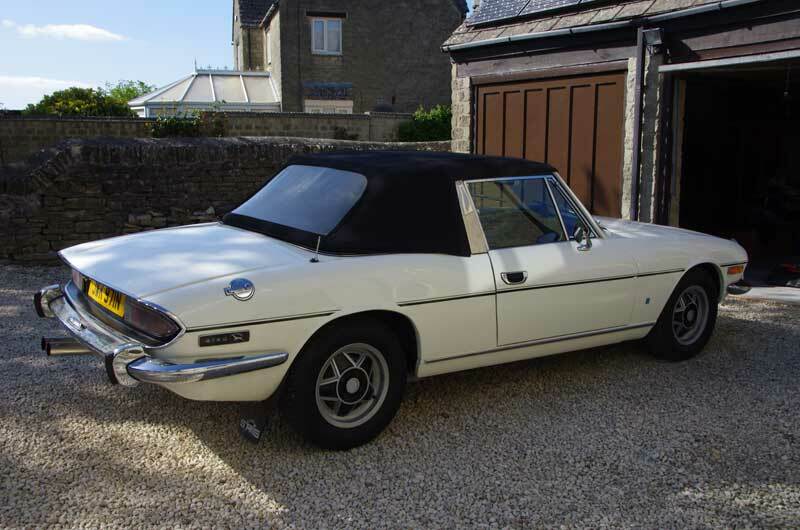 Having four cars and only two garage bays means that he’s being sent off to spend the next few months in a local barn along with a dozen or so Reliant Scimitars and Sabres. !